Despite the lack of rain, the tree frogs have been calling every night from our small pond. The croak calls are the tree frogs; the sweeter trill is an American toad. 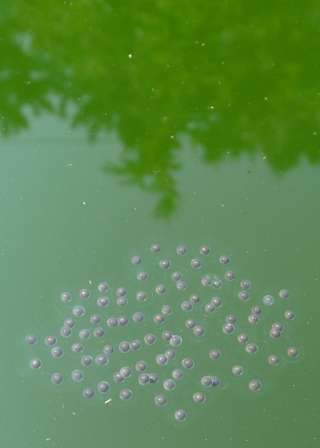 In the morning, about a dozen small clutches of eggs were floating on the water surface. Cope's gray tree frog eggs. The whole cluster is about as big as a my thumbnail. The eggs will hatch in less than a week, then the tadpoles will take another month or so to develop. To make sure that the ducks don’t destroy all the eggs, I have scooped some of the eggs masses out of the pond. I’m keeping them in a bucket until they hatch, then I’ll return the tadpoles to the pond. Ducks don’t seem to be good at catching tadpoles. This entry was posted in Bioacoustic revelry, Frogs on June 9, 2011 by David George Haskell. Better to eat frog eggs than frog legs, or so the frogs would believe.